Like most kids in the Philippines, I grew up eating Jollibee’s Chicken Joy. Many other fried chicken places have popped up around the country, but it doesn’t really stop the craving for Chicken Joy. I have friends and family who live overseas in countries where there are no Jollibee, and when they come home, it’s one of the places they make sure to eat at, even if they’re only here for a couple of days. Even when they’re traveling to countries where there is Jollibee, they make sure to make a stop there too. This branch is rather hard to get to. If you’re on your own and carrying a wheeled luggage, going there might pose a problem. It’s located on the second floor of the arrival extension area. It’s the waiting area for those meeting arriving passengers, located right beside the parking lot. It’s tiny, and there is no dine in area (or at least none that I can remember). [UPDATE 23 July 2016] There is a Jollibee at the far end of the Departure level at Terminal 1. Looks like it has a dine in area, so you can now get your Jollibee fix before flying! RELATED: Third Eye Blind to open San Miguel Oktoberfest 120! UPDATED! I haven’t been to Terminal 2 in years, but a quick Google search tells me that there is a Jollibee branch at the arrivals area, near the Philippine Airlines ticketing office. 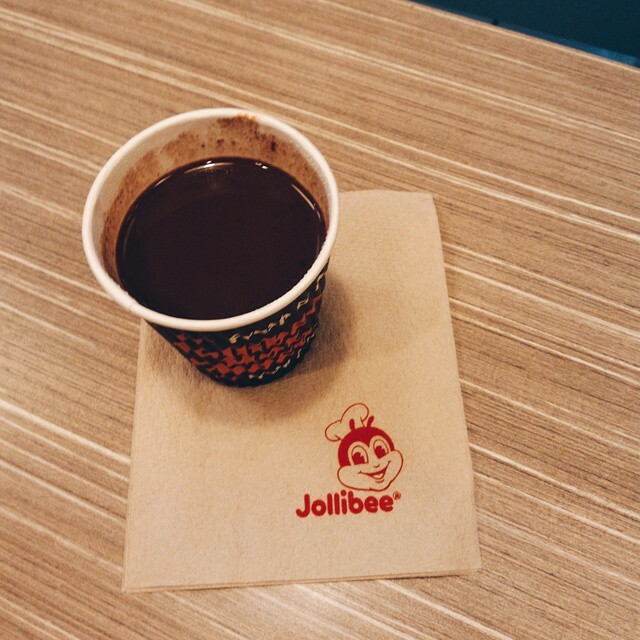 Aside from Chicken Joy, I am also a big fan of Jollibee’s hot chocolate. If you love rich dark chocolate, you’ll love this. This is the most convenient branch, because it’s right inside the terminal. It’s on the 4th floor, and does have a dine-in area, albeit pretty small. Most people just eat and go — this is not the place to loiter. The domestic terminal is really tiny, so if you’re itching for Jollibee, you’ll have to cross the street to this commercial area with several dining establishments. It’s a 5-minute walk, crossing via the pedestrian bridge. It’s not covered though, so you’ll need an umbrella if it’s raining (or if the sun’s too hot). Jollibee was recently recognized at the Mega Magazine’s 7th Pinoy Pride Ball Global Pinoy Award. This award aims to honor homegrown talent—contemporaries whose crafts have defied the odds to succeed in the global stage, and to ultimately become Pinoy Icons. Much thanks to Khursten for the Chicken Joy picture. Now, I need to get my Jollibee fix before I fly out again!